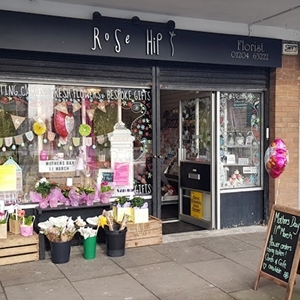 Rose Hip is a lovely florist shop based in Over Hulton Bolton. 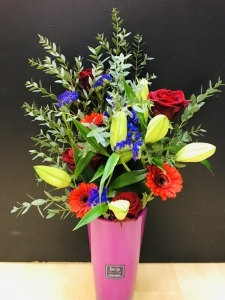 We have been established for over 7 years, providing beautiful fresh flowers for all occasions. We deliver across Bolton, Salford and Bury including local hospitals. Brilliant thankyou very much. Flowers are lovely. Excellent service from start to finish. Speedy delivery and beautiful flowers. My recipient loved them. Will defo use Rosehip again. Excellent. Exactly what I asked for. thankyou for the great service .i was told the flower where beauitful . Wreath was for my cousins funeral which I was unable to attend so obviously did not seen it, her daughter message me to say they were beautiful so was really pleased. I ordered flowers for Mother's Day at short notice (day before). They arrived on the morning of Mother's Day. I haven't seen them but my mum is very happy with them. I ordered them from Hannah Simons florist but they seem to have been delivered by Rose Hip instead. 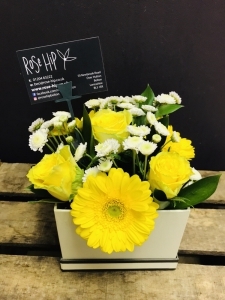 Thank you Rose Hip for going the extra mile - the client gave the wrong address and what was a sensitive delivery following the death of a child, Rose Hip went out of their way to accommodate a further delivery to ensure flowers were received by the grieving family. My aunt was delighted with her plant. thankyou so much my mum said her flowers was just beautiful it is so nice to know that living so far away in Australia that when I sent her flowers on her birthday they are fresh and just beautiful so thankyou again .from mrs bartoli in Australia . I have not seen the flowers but the recipient was delighted with them and the way they were displayed. My daughter was happy extremely pleased with the flowers. Flowers always beautiful and if not delivered first time will try again but once again have to wait ages to see if they been delivered.